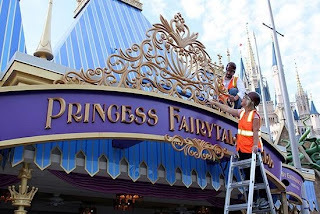 Disney Movie Princesses: Princess Fairytale Hall is Coming!!!!! Princess Fairytale Hall is Coming!!!!! Walt Disney World long has needed a truly special hall for greeting the princesses such as Snow White, Cinderella and Princess Aurora. 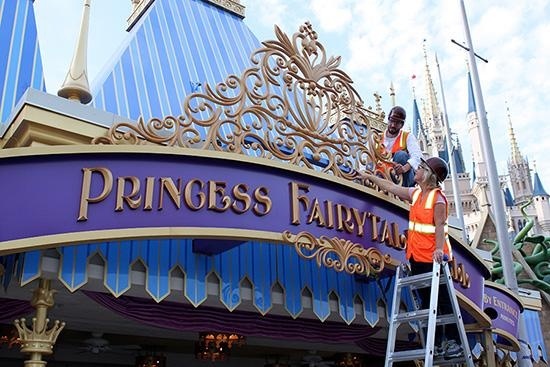 Finally, all princess fans get their wish, and the brand new Princess Fairytale Hall is coming into being at long last. Princess Fairytale Hall truly will be a mind-blowing experience for the princess' subjects. Along with a castle-like entrance, high ceilings and elegant wood-paneled rooms, the space will feature beautiful princess portraits, themed wallpaper, glittering stained glass windows and accessories. Everything has been inspired by props seen in the animated films such as "Snow White and the Seven Dwarfs" and "Sleeping Beauty." Right before the grand unveiling! There will be two queues to choose from in Princess Fairytale Hall, which is sure to be extremely popular right from the start. You may choose to meet either Cinderella or Rapunzel, each of whom will be joined by one fellow Disney princess. Magic Kingdom Park is located within Walt Disney World in Orlando, Florida. The park is open most days from 9 a.m. to 7 p.m. There will be both traditional Disney FASTPASS and the new Disney FastPass+ options. 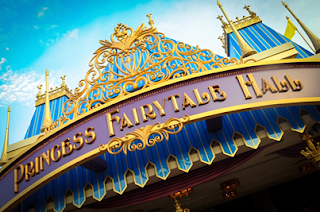 Below is a special video about the new Princess Fairytale Hall! Princess Fairytale Hall is sure to be a crowd pleaser!